Burrr! It's getting cold outside and time to bring out the winter attire. 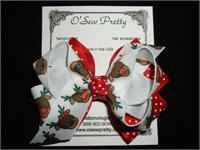 Pick out your new Christmas hair bow, Hanukkah or Kawanzaa holiday bow from O'Sew Pretty and she'll be the most fashionable bundle of joy around. 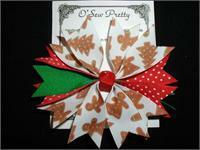 Look for more of our holiday collection coming soon! 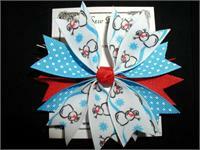 Begin by making your choice of any of the 5/8" ribbons, then choose a charm and you're done. HO! HO! HO! 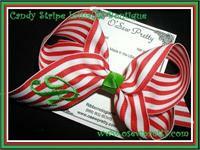 With an O'Sew Pretty bow, Santa won't fall off and will stay safe and sound through out your holiday festivities. It may be warm inside but this snowman will stay fluffy all season long. This winter wonder can be made to match any outfit! 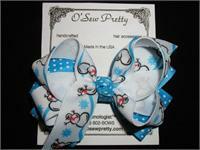 Frosty snowmen layered on winter Snow Blue adorn this designer Hair Bow. Makes a great Christmas stocking stuffer. 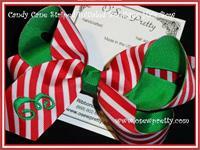 The perfect Christmas hair bow to spice up that hoilday outfit. These Snow men are sure to make her smile ! Festive Holiday Lights sure to brighten her day! 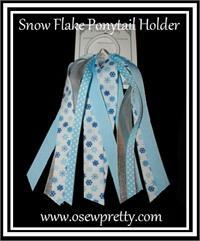 Available in Pink or Blue Snow Flakes with Silver Ribbon accents, adorn this designer ponytail streamer. Makes a great stocking stuffer surprise that she can wear almost all year long. You can say "UP TO THE ROOF TOP" with this unique style hair bow. Adorable as piggy tails. 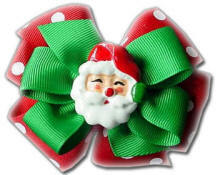 The perfect hair bow to spice up that hoilday outfit. Red and emerald green mint candy layered on red pin dot. Every special occasion dress needs a hair bow. A Portrait Perfect stacked satin hair bow. 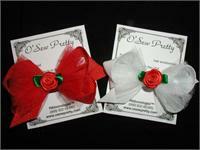 Available in Classic or Boutique style hair bows and several sizes.